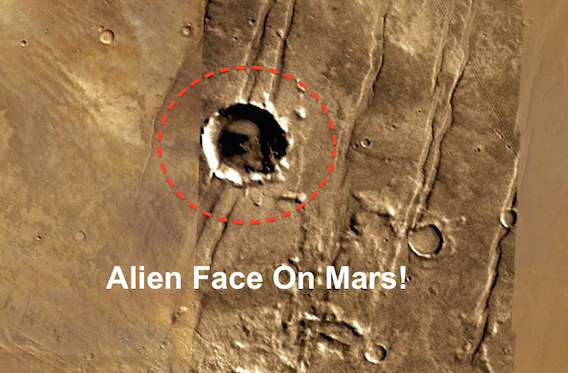 UFO SIGHTINGS DAILY: Very Artistic Alien Face Found On Mars In Crater, Dec 5, 2014, UFO Sighting News. 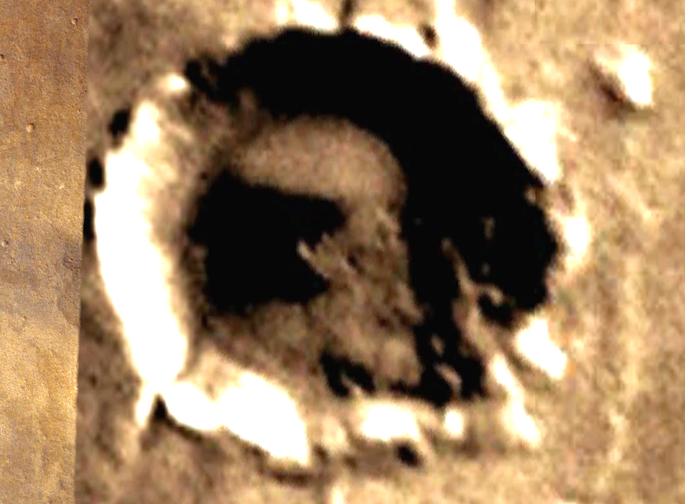 Very Artistic Alien Face Found On Mars In Crater, Dec 5, 2014, UFO Sighting News. Updated: On Dec 9, 2014 added photo with arrows to point out eye, nose and such for those who have perception trouble and cannot see it. Was checking out Google Mars...a free program to download and use, when I found this face. I have never reported on it before and it looks really big. Its hidden inside a crater and has a lot of similarities to the ancient China statues from thousands of years ago. If you know the name of the crater this is in, please tell us in comments. Google Mars ruler which is not extremely reliable, says that the diameter of the crater is 18.9km or 11.7 miles. The face itself is 8.9 miles (13km) by 5.9 miles (9.5 miles). That is one monumental undertaking to make, even making Mount Rushmore look like child's play. This face is highly detailed. No doubt is the face of a very notable historical figure in their culture. Alien Technology Discovered On Mars by Spirit Rover in 13 photos! UFO Sighting News. The Fallen King Of Mars Found At Rocknest By Curiosity Rover, Sept 2015, UFO Sighting News. Lapsis regem esse Martis diceretur. Hand Gun Found On Mars In NASA Photos! February 2016, Video, UFO Sighting News.